FreshDirect | It’s a Farmer’s Life for Them! It’s a Farmer’s Life for Them! 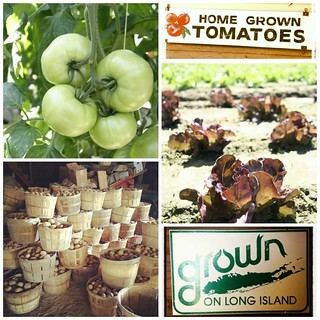 This sentiment is shared by all of the local Long Island farmers with which FreshDirect partners. The products are grown to spec for all to enjoy. Lyle and Tom share a passion for great produce and happy customers, but that’s not the only commonality between them. They have also been farming on Long Island for decades, as have the Rottkamps of Fox Hollow Farm, Billy Polak of Polak Farm and Danny Latham of Latham Farms. Tom Wickham, a Cornell University graduate, asked me if I “could imagine sitting at a computer all day, every day! ?” I guess the joke is on me! Many of these farms were started when their ancestors came from England or Germany and settled on the island. The farms have been passed down to sons and grandsons and granddaughters. Lolly Rottkamp is still the President of Fox Hollow Farm, while her son Jeff and grandsons Jeffrey and Jason run production and operations. And Lolly is right where she wants to be—at the Fox Hollow farm stand that has fed some of the same customers for over 30 years. After graduating from nursing school, she came back to the farm where she has been all her life. And in their families it will stay. Wickham’s son is running his own business in Texas but has plans of coming back to the Northeast to take over the family business in a few years. Lyle Wells, Chairman Emeritus of the Long Island Farmer’s Bureau, has a son who still helps dad from time to time when he’s not working in Manhattan. And thank goodness for that! 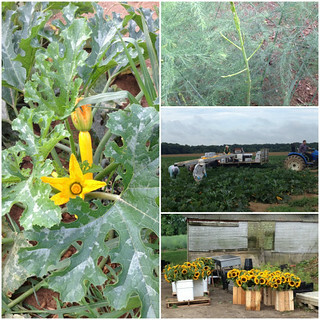 What would we do without our local zucchini, delectable squash blossoms and beautiful sunflowers? So, what brings these farmers back year after year, you might ask? After all, many of these men awake at sunrise and retire at sunset, 7 days a week; they have sun kissed faces and rough, cracked hands, and their days are hectic. But it’s their love of the outdoors, passion for agriculture and delicious food, and enthusiasm to delight the customer that makes all the hard work worthwhile. What are your favorite local produce? Let us know on the FreshDirect Facebook page or via Twitter (@FreshDirect).